ProGreen Outdoor String Lights can be used anywhere like in gardens around the plants, fence anywhere you fancy. Great for outdoor decoration because it is waterproof or even indoor. And it has 8 different modes to chose from and its very simple to maneuver. Indoor&Outdoor String lights:----Easy to use these Ball string lights will set the right mood and make an instant magic when you celebrate at a wedding or Christmas party. Automatic Timers:---- The "Timer" Button, product will be automatically on for 6 hours per day. Waterproof: ----Our led string Lights have been tested and certified as IP44 Professional waterproof, suitable for indoor and outdoor use. 8 Lighting Modes: ---- Combination, In Waves, Sequential, Slo-Glo, Chasing/Flash, Slow Fade, Twinkle/Flash, Steady on, you can choose what you want. 10.Bulb Life: Up to 50,000 Hours. If you have any question about our goods, pls feel free to contact with us and we will supply you best after-service, thank you! 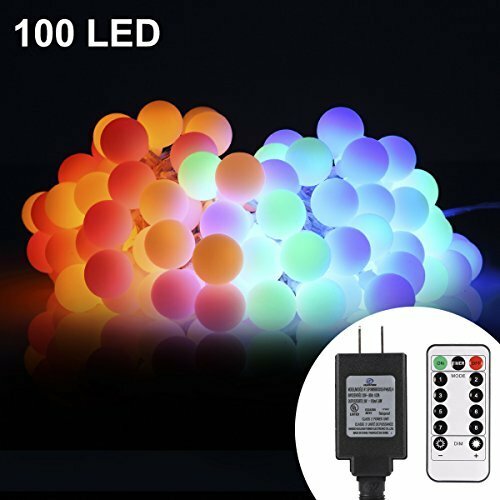 REMOTE DIMMABLE 8 MODES: Control the 100 LEDs String Lights with the wireless remote control, 8 Modes: Combination,In wave,Sequential,Slo glo,Chasing/Flash,Slow fade,Twinkle/Flash,Steady on,Off. AUTOMATIC TIMERS: The "Timer" Button, product will be automatically on for 6 hours per day. SAFE FOR USE: UL Listed Power Supply. Really safe DC 29V low voltage transformer (plug) for use in your home. If you have any questions about this product by ProGreen, contact us by completing and submitting the form below. If you are looking for a specif part number, please include it with your message.